and during main stage performances. 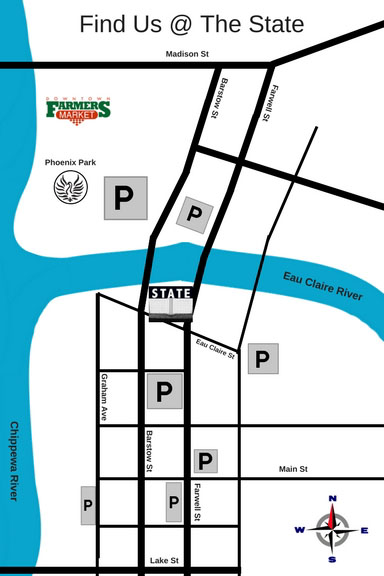 Abundant parking is available throughout downtown Eau Claire and is free after 6 PM on weekdays and all day on weekends. Please take advantage of the Civic Center parking ramp south of the State Theatre or other municipal lots, and refrain from parking in private lots that are posted. View directions from the west. At Clairemont Ave., bear to the right and continue south on Clairemont Ave.
At Cameron St. turn left and follow it to the downtown area, crossing the Chippewa River. Turn right at Eau Claire St.
ECRAC is located on the right. View directions from the east. Follow US Hwy 29 West to Chippewa Falls. Travel south on Hwy 312 until the Eau Claire city limits (Hwy 312 and Business 53 join). Follow Business 53 to Main St. Turn right on Farwell St., go two blocks. Turn left on Eau Claire St.
ECRAC is on the first block on the right. View directions from the north. Follow southbound US Hwy 53 to Eau Claire. View directions from the south. From I-94, coming into Eau Claire take exit 70 and go north on Highway 53; when Business 53 breaks off to the right, follow Business 53 to Hastings Way which is also heading north. Turn left on Brackett Ave.
At the bottom of the hill, turn right on Farwell St.
View directions from the Hwy 53 By-Pass. Exit onto River Prairie Dr. Go west to downtown. Follow River Prairie Dr. (it turns into Birch St.) to the first stop light at the bottom of a long hill. Turn left on Farwell St. Turn right on Eau Claire St. (the first stop light). ECRAC is one block down on your right.